Ankam is engaged in design and manudafacturing water park equipments, Water Slides, Water Play Systems, Water Fun Play Systems, Aqua Fun play systems. 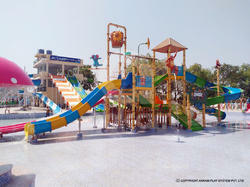 Ankam has varied play systems designs to suit customers and can custom design as per customer requirements. 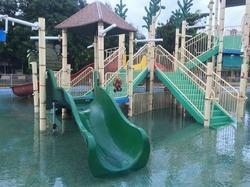 We are specialized in 4 Platform Water Play System with custom themes as per requirement of the client. Aqua Fabulous i.e. Multi-activity Play Systems are more popular among Small and Medium water park operators due to its good ROI, As it provides entertainment across all ages and genders. Multi Activity Play Systems are Boarded with Multiple slides from Various Heights, Up to 100 water Activities, Huge Tilting Bucket and nozzle and interactive games. Interactive features along with multiple water features like Rotating Wheels, Inverted Umbrella, Free Flow Systems. The equipment is unique and it attracts lots of visitors. The 1000ltr. Splash Bucket gives a thrilling experience. This System provides Maximum ROI for Entertainment, therefore, a Must have equipment for Small, Medium and Large water park operators. We are offering Mini Pool Water Slide to our client. 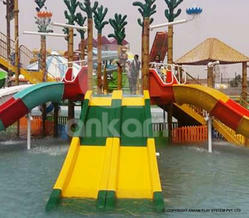 This Water Play System has Splash lamp with the roof, Water Curtain and Nozzles at different places sprinkling water all across the system.We are the company engaged in Manufacturing and Exporting the wide range of Water Slides and Water Park Equipments and guide every aspect of Water Park project in terms of Planning, Designing, Constructing, Engineering, and Commissioning. We are offering Multi Activity Fun Water Park Equipment to our client.We offer this one at extremely feasible rates as well. 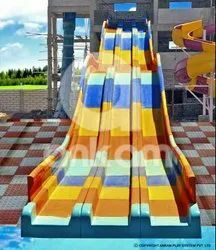 The company is recognized as a leading manufacturer, trader, and supplier of Combination Water Slides.This Slides can be available at different heights.We Specialized in manufacturing Theme based Water Play Systems. 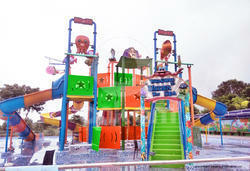 We are manufacturer and Export wide range of 6 Platform Multi Play System (Aqua Fabulous) and are specialized in Theme based Water Play Systems(Theme Aqua fabulous), We also make custom designed themes for our clients. 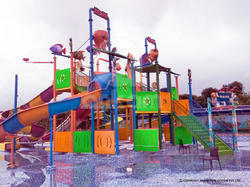 6 Platform Water Play system covers the area of 20mtr * 20mtr. This system has 6 conventional Water Slides, Multiple nozzle activities with two water guns, one on the system and other in the pool to create interactive playing between users. Multi interactive features engaged users and provide a great level of entertainment. The equipment is unique and it attracts lots of visitors. The 1000ltr Splash Bucket gives a Thrilling experience. This system is a great attraction for any Water Park. 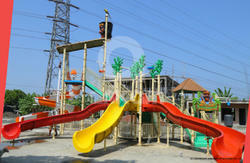 We are offering Multi Activity Play System to our client. Water Park project in terms of Designing, Planning, Constructing, Engineering, and commissioning.It is a wide body slide wherein multiple riders slide together on the bumps before landing in the pool and suitable for all ages.This slide is available in attractive colors.This Slides can be available at different heights.We Specialized in manufacturing Theme based Water Play Systems. We are offering Multi Play Systems to our client. We are the company engaged in Manufacturing and Exporting wide range of Water Slides and Water Park Equipments and guide every aspect of Water Park project in terms of Planning , Designing, Constructing , Engineering and Commissioning. This Multi Play Systems product is a favorite amongst People and even adults and gives them moments of joy.We are offering Multi Play Systems to our client. We are the company engaged in Manufacturing and Exporting wide range of Water Slides and Water Park Equipments and guide every aspect of Water Park project in terms of Planning , Designing, Constructing , Engineering and Commissioning. This Multi Play Systems product is a favorite amongst People and even adults and gives them moments of joy. Can be customized to meet space and budget needs.It is a high capacity slide and mass pleasure.Steep Slopes and wavy design make it a scary and adventurous slide. Looking for Multi Play Systems ?